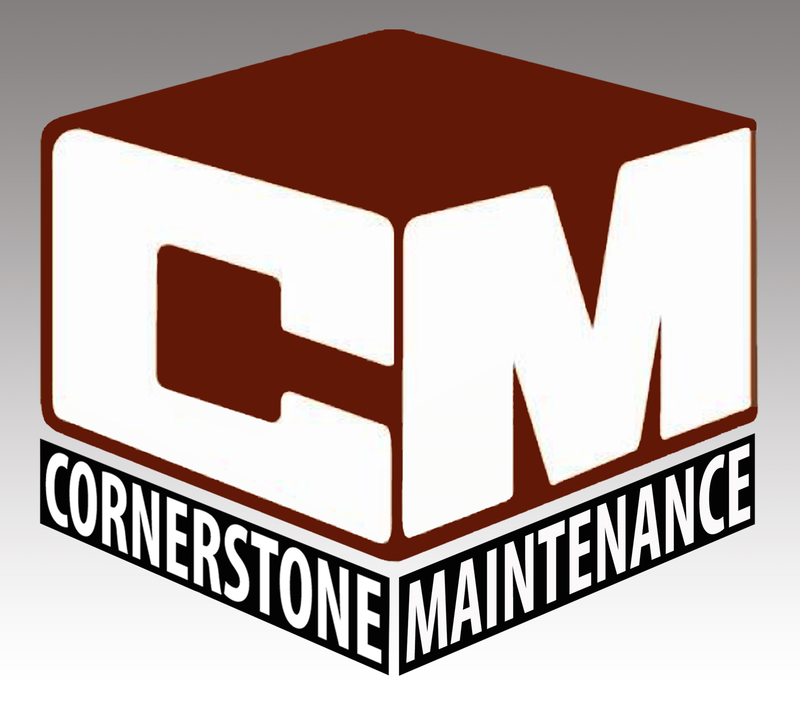 Cornerstone Maintenance Services has been serving Victoria properties since 1995 and our team of experienced journeymen and highly trained technicians offers our customers reliable service with an emphasis on quality workmanship. We are familiar with the infrastructure, tight budgets and deadlines our clients are faced with and are prepared to offer our skills and experience to contribute; working toward a brighter future for your investments. The service we provide fits into a few categories: reactive maintenance, proactive maintenance, design/build for renovations or restorations, after hours emergency response for a complete range of emergencies, and other special situations. Leak detection, damage/cost mitigation, complete repairs (location of water problems i.e. Roof, below grade, walls, irrigation). Sump pump clean out and motor repair. Inspections on a weekly, bi-weekly, monthly, semi-monthly, quarterly basis, depending on the purpose. Irrigation Maintenance including winterizing and spring start up. Roof fan maintenance (filter changes, oiling and greasing, belts, motor repairs). Paint/stain – protection exterior products from the elements. Changing out caulking in bathtub areas. Carpentry: Design/construct decks, fences, etc. Waterproofing (below grade, walls and decks). Painting – interior and exterior. Work with architects and engineers to create inspiring and functional living spaces. We have five experienced flood restoration specialists on our team. We have pre-existing service agreements with other local professionals and will coordinate responses for a complete range of emergencies including snow removal. We are fully insured and our team is covered by WorkSafe. We are budget oriented with an emphasis on design, pre-planning and communication. Our team is professional and thorough with a focus on jobsite cleanliness. Our lower hourly rate of $49.00 plus tax would be for work such as snow removal, ice-melt spreading (during regular business hours), painting/staining, power washing, digging, changing light bulbs, garbage collection/disposal, cleaning, checking in on a vacant residence, emptying catch basins, and removing debris from gutters. For work requiring a higher technical ability our hourly rate would be $65.00 plus tax. Some examples of this type of work would include leak/flood restoration, electrical maintenance/ballast replacement, plumbing, drywall repairs, tiling, irrigation maintenance including spring start up, design/build complete renovations, carpentry: decks – fences - concrete, door and door closer adjustments/replacement, various installations: countertops, fixtures, blinds/drapes, pictures etc. The aforementioned rates are only applicable on time plus material jobs. To confirm pricing on larger jobs we are more than happy to provide a free no obligation quote. 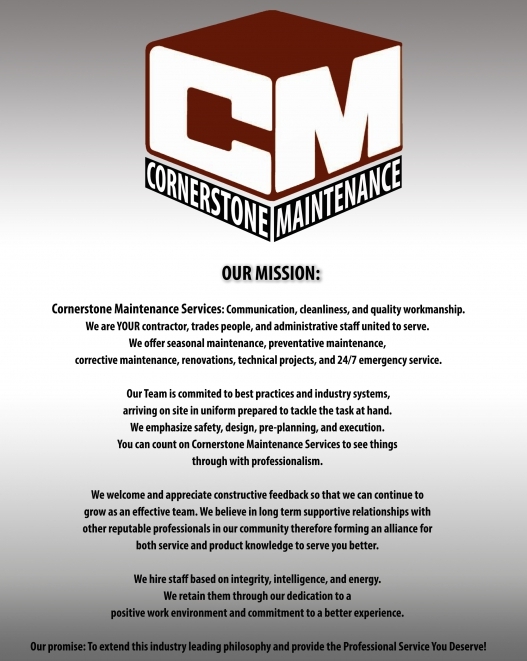 We look forward to working with you for all of your maintenance needs. Should you have any questions or require further information, please do not hesitate to contact Channing Knull (Manager) at (250) 475-2005 ext. 213 or directly by email at cms@cornerstoneproperties.bc.ca.